There is something to be said about open-style galley kitchens. My beautiful kitchen is complete with cherry cabinets, black granite counters, gas stove, and accents of chrome with full view of the entire great room. It is my favorite spot in the condo, which should surprise absolutely no one. But it has become something else for me, the place where I'm trying my damnedest to get back on both of my feet. I got cleared to start weight bearing a few days ago and it has gotten to the point where I can start almost putting all of my weight on the ankle. I will pace back and forth in the kitchen with my arms out, using the counter tops to catch me when I inevitably fall over. But I'm getting so close! This weekend, I got to take my first crutch-walk in my neighborhood. I went to my favorite cafe for coffee and croissants followed by a visit to my farmers market on the way home. What used to be a usual Saturday has become such a luxury and I'm so thankful to be getting back to normal. To be independent. And mostly, to smell garlic cooking in my kitchen again. That fragrant perfume is currently wafting through my living room, a reward from my trip to the farmers market. I got huge local garlic, just picked leeks, the last of the zucchini, and a lot of new vendor friends because my large metal accessories attract a lot of conversation. 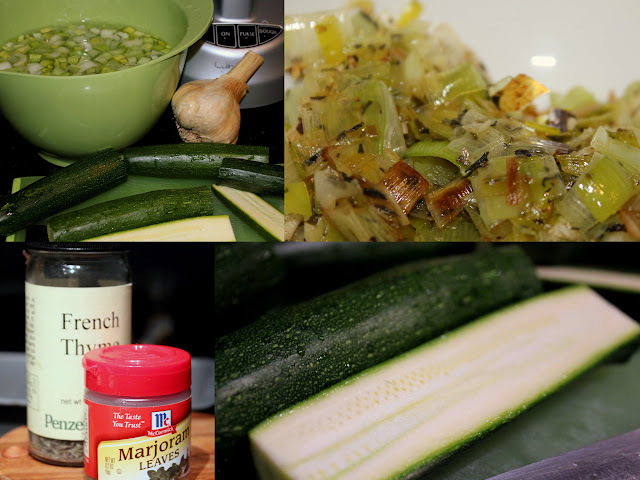 Using these three items as inspiration, I combined my family's zucchini quick bread recipe with the idea from Ruth Reichl to pair zucchini and marjoram. I basically took my sweet version, removed most of the sugar, and replaced it with melted leeks, garlic, and dried herbs. I slowly sauteed the leeks in an obscene amount of butter to soften the texture, added finely minced and intensely scented garlic, and revived dried marjoram and thyme in the last few minutes of cooking. I let the leeks cool (while resting, I could do things in about 15 minute intervals) and then combined it with shredded baby zucchini (seeds and skin included due to baby-ness), eggs, olive oil, and buttermilk. After gently folding in the dried ingredients, I baked it low and slow to ensure the bread stayed moist and the zucchini was completely cooked. As the bread was baking, the smell was intoxicating enough to draw my sister out of her room (okay, some of it was Gossip Girl). She was certainly skeptical of a savory version of a Toasty classic but I definitely think that I won her over! Because zucchini bread is not complete without cream cheese, I quickly mixed in some finely minced sundried tomatoes and schmeared it over a still warm slice. I'm really proud of this bread and can't wait to have a slice with lunch! Preheat the oven to 325 F. Prepare two 9x5 loaf pans with butter and a light coating of flour. To clean the leeks remove the green tops and stem, cut the middle white part in half lengthwise, cut into half moon pieces, and let soak in a large bowl of water. Using your fingers, ease apart the layers of the leek to get out any grit and then carefully remove and pat dry. Over medium low heat, melt 2 tablespoons of the butter and add the leeks. Cook until the leeks begin to soften and just start to brown, about 4-5 minutes. Add the rest of the butter and the minced garlic. After about 2 more minutes, add the herbs, 1/4 teaspoon of salt, and pepper and let cook for another 2-3 minutes. Pull off and let cool. Wet ingredients: whisk the eggs briskly until they have lightened in color. Add the oil, buttermilk, and sugar and then combine with the shredded zucchini and cooled leek mixture. Dry ingredients: Whisk or sift the flour, 1/2 teaspoon of salt, baking soda, and baking powder. In three batches, fold gently into the wet ingredients. The dough will be thick and slightly sticky. Divide evenly in the two prepared loaf pans. Bake at 325 for about 40-45 minutes. Let cool and serve with cream cheese. For my sundried tomato cream cheese, just mix a few tablespoons of cream cheese with 3-4 tomatoes finely diced. Enjoy! I love your twist on the typical zucchini bread. I get tired of the sweet breads. My kitchen is my favorite place in the house too. It's funny that company always seems to gravitate there too. Thanks! I think i've realized over the course of this blog that whenever I eat something I want to take the sugar out. I feel like i'm betraying my gender's allegiance to dessert but it tastes so good! Just popping in to see how you're doing ... hope you're starting to feel more perky ... careful of that ankle, now! It takes so long to heal properly! Now, about this savory zucchini bread - what a nice break from the usual! I think I would love it toasted and with a slice of Gouda melted over top! Glad to hear you're on your way to mending and your Saturday adventures do some like fun. Yummy looking bread, too!